UniPunch provides a variety of standard and custom notching units. 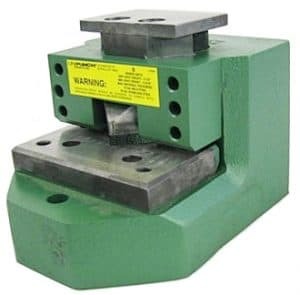 UniPunch Standard 90 degree 5” x 5” and 3” x 3” notching units are self-contained dies. The pilot pins extending below the base of the holder are concentric with permanently aligned punches and dies for quick accurate template positioning. These right hand and left hand style units are designed to operate as stand-alone tools or can be used in conjunction with UniPunch “B” series hole punching units to punch and notch parts within the same press setup. Corner notch units are in stock for immediate delivery. 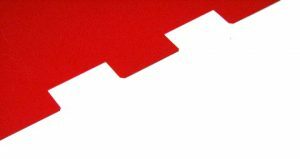 For corner notches larger than 5” x 5”, UniPunch provides a 2 post design, 8” x 8” unit which is also compatible with our “B” series hole punching tools. Die clearance is pre-set at the factory for notching 22 gauge (.76mm) to 10 gauge/.134” (3.4mm) mild steel. Replacement punch and die blades, springs and other components are available from stock. Optional accessories include: Gauging plate with built-in scales and adjustable stops and adjustable side gauges. Note: Punch & Die steel for the 8” x 8” corner notch unit are not interchangeable. Unit must be returned to the factory for replacement. Spare Punch & Die steels can be supplies with new unit. UniPunch “B” series Edge Notch Units are available in a variety of shapes and sizes. Die clearance is set at the factory for specific material types and thickness. These units are designed to notch from 22 gauge (.76mm) to 10 gauge/.134” (3.4mm) mild steel. Edge notching units can operate as stand-alone tools or can be used in conjunction with UniPunch “B” series hole punching units to punch and notch parts within the same press setup. Provide a sketch or drawing for quotation. In addition to standard rectangular notches, irregular notching configurations and combination notch and punching units can be manufactured to your specifications. Provide a sketch or drawing for quotation. UniPunch units are rugged holders that allow you to notch burr-free parts with minimal maintenance. Note: Punch & Die steels on Edge Notch Units are not interchangeable. Units must be returned to factory for replacement. Spare Punch and Die steels can be supplied with new Units. UniPunch “B” series 90 degree Vee Notch Units are self-contained dies available in standard depths of 1” (25.4mm), 1 ½” (38.1mm). Die clearance is pre-set at the factory for notching 22 gauge (.76mm) to 10 gauge/.134” (3.4mm) mild steel. 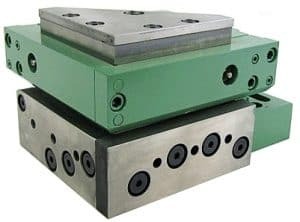 Vee notching units can operate as stand-alone tools or can be used in conjunction with UniPunch “B” series hole punching units to punch and notchparts within the same press setup. Special Vee Notch Units with blade angles less than or greater than 90 degrees are available. Provide a sketch or drawing for quotation. UniPunch units are rugged holders that allow you to notch burr-free parts with minimal maintenance. When notching angle iron, a 1/8″ radius on Notching Blade is recommended. Note: Punch & Die steels on Vee Notch Units are not interchangeable. Units must be returned to factory for replacement. Spare Punch and Die steels can be supplied with new units.